Are these happy feet? They sure seem like happy little guys! All dressed in their winter scarfs and hats, and sporting rosy cheeks. 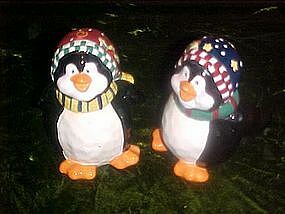 They are made of hand decorated glazed ceramic. They measure 4 1/4" tall and are marked BICO. Plastic stoppers and are in perfect condition.